Dog Sunglasses: Are They Really A Necessity? Or Just A Fashion Statement? Just about every day you’ll see a car going down the road with a dog’s head sticking out of the window. I know, my dogs do it too. The youngest enjoys sticking his head out the back window of our Jeep Wrangler. With all the bugs, dirt, and debris flying through the air, imagine the damage if your poor dog should get hit in the eye by something. Dog sunglasses (or dog goggles) can be quite useful when it comes to protecting your dog’s eyes. How Do Goggles Protect A Dog’s Eyes? Michael Brinkman, DVM and Veterinary Ophthalmologist, recommends that dogs wear specialized goggles or glasses just for dogs for many reasons. There are also a number of chronic canine eye diseases and conditions that require the avoidance of direct sunlight. Even something as simple as pink eye can affect dogs just like it does humans. Dog goggles or dog sunglasses can significantly reduce glare, which could make all the difference as to whether your dog can even be outside at all — if your dog has cataracts or another eye condition. As a human, you know how hard it is to see on a bright sunny day in the winter without the white snow blinding you. Sun and snow blindness can be the same for dogs too. 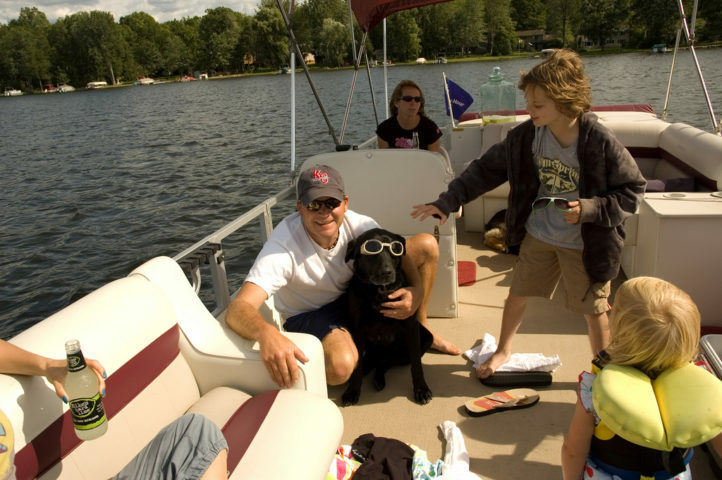 Dog sunglasses can also keep overspray and harmful objects from entering your dog’s eyes — like salty sea spray while boating, bugs in the eye while riding in the car, etc. And they’ll keep your dog’s eyes from drying out with too much wind. Mesh goggles are another form of dog eye protection. While these don’t block out air flow, they do offer protection from impact. It’s similar to looking through a screen door up close. Sure, there’s a small reduction is visual clarity, but the trade-off is worth it to protect your dog’s eyes. 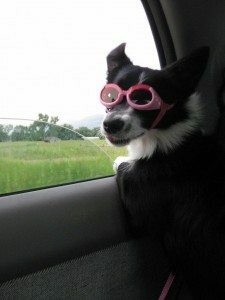 Although many people put sunglasses on their dog merely as a fashion statement, it’s clear that dog goggles actually do serve a purpose, if nothing else than to keep your dog’s eyes from drying out while riding in the car with the window down. If you can get your dog to wear them, they’re worth the $10 to $30 investment to protect your dog’s eyes. First, make sure you get the right size. 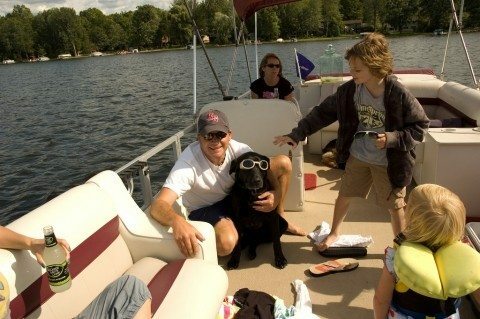 Proper sizing of doggy sunglasses is as important for your dog as it is for you. They will provide very little protection if they don’t stay in place. Not to mention the fact that the wrong size could hamper your dog’s vision, as well. Here’s a helpful sizing chart for Doggles. Measuring your dog for sunglasses varies depending on the manufacturer. It definitely takes more to hold dog goggles in place than it takes to hold glasses on a human’s head. You may have to measure around your dog’s head and under the neck. For goggles to stay in place, they attach more like a harness. Chin Strap: Start just under one ear, under the chin, and back up to under the other ear (like a helmet strap). Dog sunscreen if your dog is fair skinned and spends a lot of time outside — because yes, dogs can get a sunburn and even skin cancer! Dog seatbelt if your dog rides in the car with the window down — because yes, dogs can fall out of the car window! Dog life jacket if your dog goes boating or swimming — because no, not all dogs know how to swim! Dog helmet if your dog rides on your bicycle or motorcycle — because no, not all dogs know to sit still and enjoy the ride! Did you know that many states require eye protection for anyone riding a motorcycle or other vehicle that doesn’t provide a windscreen to protect the occupants? Having something strike the soft tissue of the eye at fast speeds could be catastrophic — for a human or a dog! We take care of our kids by protecting them from hazards and harsh conditions. Taking care of our furry kids is just as important as after all they are a part of the family too.